For other places with the same name, see Bristol (disambiguation). Bristol  is the unofficial capital of the West Country of England. Famous for its maritime history it also offers a great and diverse range of attractions, hotels, bars and events. The best time to visit is in the summer when major festivals are held in the city. Brunel's Clifton Suspension Bridge spans the Avon Gorge. Bristol is the United Kingdom’s eighth most populous city (approximately 450,000) and the most populated city in South West England. It received a Royal Charter in 1155. From the 13th century, for half a millennium, it ranked amongst the top three English cities after London, alongside York and Norwich. 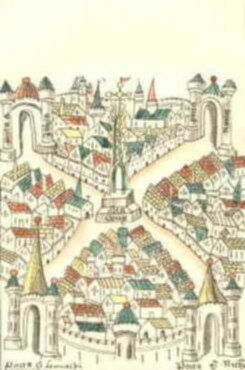 It borders the counties of Somerset and Gloucestershire and is also located near the historic cities of Bath to the southeast, Gloucester to the north and Cardiff, the capital city of Wales which lies to the northwest. The city is built around the River Avon, and has a short coastline on the estuary of the River Severn where it flows into the Bristol Channel. Bristol is an excellent base for exploring the West Country, with relatively inexpensive accommodations compared to nearby Bath and a huge choice of bars, restaurants and shops. It's one of the most culturally vibrant cities in the South of England, hosting a wide variety of visual arts, theatre, speciality shopping and live music. Bristol Airport is situated a few miles south-west of Bristol city centre and offers direct services to over 125 destinations across Europe. The major international hubs of Amsterdam, Brussels, Frankfurt and Dublin continue to be served by KLM, Brussels Airlines, bmi regional and Aer Lingus making hundreds of onward connections across the globe accessible from Bristol Airport. The airport is also a major hub for budget airline providers Easyjet and RyanAir. There is a Flyer bus service which links the airport to the city it is available 24 hours a day, 7 days a week and the journey takes 30 minutes. At peak times, it leaves up to every 8 minutes. It costs are £11 for a return ticket (the second part of which can be used up to a month after the first), £7 for a one-way. BS48 3DY On 0.4 miles / 3 minutes CCTV, high perimeter fencing, security lighting, entry/exit barriers and security patrols. Yes Maximum vehicle size is a minibus. Trailers are allowed, but prior notice must be given to the car park. BS48 3DY On 0.2 miles / Walking distance CCTV, entry/exit barriers and regular security patrols 24 hours a day. Yes Special assistance for Blue Badge holders is available, and Help buttons are located at the entry/exit barriers. BS48 3DY On 0.5 miles / 5 minutes CCTV, high security fencing, entry/exit barriers and regular security patrols 24 hours a day. Yes Trailers are allowed, but prior notice must be given to the car park. Customers' vehicles are parked in a secure, on-airport car park. On Customer is met at terminal. No transfer required. CCTV, high perimeter fencing, entry/exit barriers and regular security patrols. Yes Customer is met at the terminal upon departure and arrival. BS48 3DY On N/A Met at the terminal CCTV, high security fencing, entry/exit barriers and regular security patrols 24 hours a day + disabled access. Yes Regrettably, no cars with trailers are permitted to use the meet and greet service at Bristol International Airport. Heathrow Airport is about two hours drive straight down the M4 (westbound) motorway. Alternatively the RailAir express bus service (running every 20 minutes) connects with the main London to Bristol rail service at Reading rail station; expect the total journey to take slightly over two hours. National Express  also operates an hourly direct coach service between Bristol and Heathrow. Birmingham International is within quicker (and cheaper) reach of Bristol than London's two other airports, Gatwick and Stansted. By car it takes about 2 hours and you'll be avoiding the congestion-prone M25. Rail services connect Birmingham International to Bristol every 30 min at peak times with a change in Birmingham New Street. The journey takes between two and two and a half hours. Gatwick Airport is about three hours drive away via the M23 (northbound), M25 (clockwise) and M4 (westbound) motorways, and is also reachable by National Express coach service. Alternatively, take the train from Gatwick Airport railway station (located in the South Terminal), changing at Reading. Stansted Airport is about three hours drive away via the M11 (southbound), M25 (anti-clockwise) and M4 (westbound) motorways. By train you will need to catch a Stansted Express train to London Liverpool Street station, the tube to London Paddington station, then follow the directions below; expect the total journey to take around three and a half hours. Cardiff International Airport is about one hour west of Bristol, going northbound from Culverhouse Cross, to J33 of the M4, then Eastbound, to Bristol. Alternatively take the train direct from Cardiff Airport, to Cardiff Central Station, then take another train to Bristol Temple Meads Station . Bristol Temple Meads station is located approximately 15 minutes walk from the city centre and has regular inter-city and regional train services from Bath, Birmingham, Cardiff, Edinburgh, Exeter, Glasgow, London, Plymouth, Southampton, Swansea and York. It is the oldest, continuously and still operating train station in the world. Bristol has a second main railway station in Bristol Parkway, which is located several miles north of the city centre. This station also has frequent services to many of the same locations as Temple Meads. From London, you can travel from London Paddington station. There are several direct trains an hour and the journey only takes 1 hour 45 minutes. Train times (from any location) can be found on the National Rail Planner or by calling 08457 48-49-50 from anywhere in the UK. National Expressoperate services to Marlborough St Coach station, located in the city centre, from cities throughout the UK including London. The journey from London to Bristol takes about 2h30min. Tickets are much cheaper if booked in advance online. Megabus also operate budget coach services from London and other UK destinations to a stop on Bond Street, Cabot Circus, near Haymarket. Tickets must be booked online and fares are demand responsive but can be very cheap (£1.50 if you book far enough in advance). The journey to London takes about 30 min longer than by National Express. Megabus have expanded in 2017 and now offer direct services to Heathrow and Gatwick Airports and Barnstaple amongst others. South West Falcon is a 24 hour coach service linking Bristol with Bristol Airport, Taunton, Exeter and Plymouth. Pay the driver on the coach or it is possible to book through Megabus See the website for stop locations. The M5 and M4 motorways intersect near Bristol and the M32, a motorway 'spur', brings traffic directly into the city centre. The M4 links London with Bristol with a driving time of less than two hours. 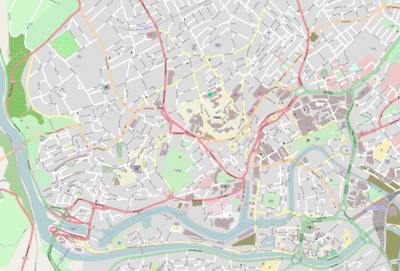 Parkopedia.com  is a free service that allows users to search and compare parking rates and locations for commercial and private parking facilities in Bristol . Visit Bristol the official tourism website for Bristol has free maps of the city for visitors. Distinctive blue A3 tourist maps which cover the city centre, the Harbourside and Clifton, are available for free from the Tourist Information Centre on the harbourside and also from locations such as libraries, shops, Temple Meads railway station, hotels and the YHA hostel. Detailed maps for districts within the city (such as Fishponds and Lockleaze), cycle, bus and a very detailed harbourside map are available from the City Council . Most locations in central Bristol (the Harbourside and Old City areas) are reasonable easily walkable, and there are plenty of attractive walking routes along the quaysides and in the pedestrianised central streets. The main rail station (Bristol Temple Meads) is a little further (about 15 mins walk) but still accessible by harbourside walkways or by bus. Bristol walking directions can be planned online with the walkit.com  walking route planner. Bristol has plenty of bike paths and routes and is at the centre of the National Cycle Network . Sustrans, which manages the network, is based in the city, and has a shop and information centre on College Green, next to the Marriott Hotel. The staff can provide information on cycle routes throughout the UK. Free cycling maps for the Avon Cycleway, Bristol and surrounding council regions (South Gloucestershire, North Somerset, Bath and North-East Somerset) can be obtained by emailing, telephoning or writing to Bristol City Council's Transport Planning Team . Bristol Temple Meads offers direct trains to many UK cities including London (Paddington). It is also one terminus of the Severn Beach Line which passes through Lawrence Hill and Stapleton Road in the East of the inner city; Montpelier, Redland and Clifton Down in the north before heading north-west to Severn Beach, although off-peak trains terminate at Avonmouth. The route is quite scenic - the line itself has been voted one of the most scenic in the world by Thomas Cook; the fares are cheap (a 7 day season ticket between Temple Meads and Clifton Down is £3.90 and an off-peak day return is £1.50), quick (Temple Meads to Clifton Down takes about 15 minutes) and usually punctual and reliable. The Severn Beach train usually runs approximately hourly from 0600 to 2200hrs, Monday to Saturday, with a reduced Sunday service from summer 2008, but check details using Transport Direct  before travelling. Bristol Insight offer open top bus tours with commentary from February-December. The route takes in most of the major visitor destinations including the Clifton Suspension Bridge, Bristol Zoo, City Docks, Temple Meads, old city and city centre. Most bus services in Bristol are operated by First Bristol. Live departure times are shown on most bus stops. As most of Bristol's hotels and places to visit are located near the city centre or are in the upmarket suburb of Clifton, First Bristol's number 8 and 9 buses are probably the most useful for visitors. They follow a route from Temple Meads station to Clifton, passing through the main shopping area (Broadmead), the city centre (also handy for the harbourside) and the West End on the way. An increasing number of Bristol's buses now run 24 hours a day. FirstDay tickets are valid until 4AM the following day, and Night Riders, unlimited travel tickets costing £3:00 are available after 7PM and are valid until 4:30AM the following day. Other operators include Wessex Connect and Abus. Because of the way the city centre is intimately interwoven with the old 'floating harbour', a boat is a good way of getting around as well as seeing a lot of interesting sights. Bristol Ferry Boat  runs several ferry services around the harbour, stopping at various quays on route, and even providing a commuter service between the city centre and the main rail station. The Bristol Packet  offer city docks tours with commentaries daily during school holidays and at weekends throughout the year. They also run regular excursions to riverside tea gardens on the Avon towards Bath and Avon Gorge cruises under the Clifton Suspension Bridge to Avonmouth and back. 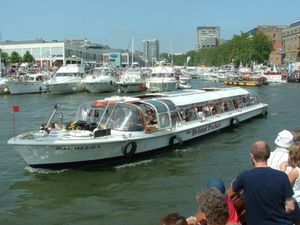 Number Seven Boat Trips  also offer a ferry service during the summer months. Bristol City Council offers a useful walking and public transport journey planner at . Bristol is quite a hilly city, but if you don't mind walking up hills the walk can be pleasant on a fine day. Driving is probably the easiest way of seeing the surrounding region. Traffic can be an issue however, so public transport, cycle or on foot is best where possible. There are plenty of multi-storey and council or privately run car parks throughout the city. There is on-street parking throughout, but it can get busy, and a number of residents parking schemes run throughout the city. Taxis can be an expensive way to get around the city. There are about 700 licensed taxis (Hackney Carriages) and these can be distinguished by roof signs and meters charged at a rate set by the council. There are a similar number of private hire vehicles (without roof signs) that need to be pre-booked. All legitimate taxis and private hire vehicles should have a predominantly yellow council-issued plate at the front and back of the vehicle. More information on taxis and private hire vehicles and a cab rank map can be found at Taxis and Minicabs in Bristol . Uber also runs in Bristol, but these drivers are not required to be licensed. Bristol has many attractions you’ll not want to miss. So much in fact, it is sometimes difficult to find out what you definitely shouldn’t miss. Therefore the following list provides some things you really don’t want to miss. 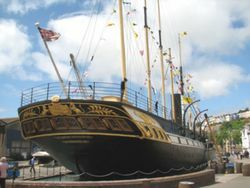 The floating harbour is the jewel in Bristol's crown, and many of its attractions are on or close to the harbour. Bristol's Eastside is the multicultural centre of Bristol and offers visitors a refreshing alternative side of the city, made up of a colourful collection of neighbourhoods that boast independent retailers from all around the globe. The wonderful thing about this side of town is simply walking around it - and most of the good things to do and see are free! Details of other city parks can be found on the city council website. 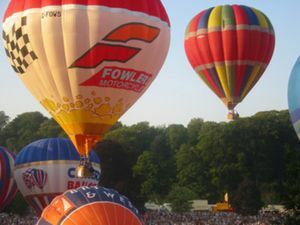 There are various websites publicising these events, and Visit Bristol compiles those which are of most interest to tourists. Saturday's edition of the Bristol Evening Post has a free pull-out supplement called Seven that lists much of what is on offer in the city during the following seven days. Alternatively you can check out Bristol Music & Theatre listings online on Bristol Music which also house's contact details for all local venues and music contacts and reviews. Pubs offering live music of some sort are extremely numerous in most areas of the city. This showcase cycle path runs on a disused railway line from central Bristol to Bath. With its traffic free tarmac, gentle gradients, and only two minor road crossings on its 22km stretch, it is ideal for cycling. At a leisurely pace the journey to Bath takes a good 2h through green suburbs and some attractive countryside. If you are too tired to cycle back, you can take your bicycle free of charge on one of the frequent trains from Bath Spa to Bristol Temple Meads station. The journey takes 10-15 min. From Bath, you can continue cycling along the towpath of the Kennet and Avon Canal all the way to Bradford on Avon, taking another hour or so. Though not paved and somewhat narrower than the Bristol to Bath cycle path, the towpath is still traffic free and the scenery even more beautiful. There are two or three places to stop and eat or drink on the way. The aqueduct at Avoncliff is worth seeing. From Bradford too there are direct trains back to Bristol that carry bicycles. You can view a PDF map at Bristol and Bath Railway Path . Bristol is home to two universities: University of Bristol and University of the West of England . There is also a music college on King Square, the Bristol Institute of Modern Music, which from September 2009 will offer a BA (Hons) course in Professional Musicianship. Circomedia offers a one year diploma in Circus Skills and Physical theatre. The largest independent employers in Bristol are the two Universities, the Orange telco, Airbus, Rolls Royce, Hewlett-Packard/Compaq, AXA and various media companies including BBC Bristol (famed for its natural history department), HTV West and Endemol. The Ministry of Defence has a large site employing around 5000 people in the north of the city. Office space is available to rent at * Studio 31 , , tel: +44 117 923 7947, . which offers a creative work environment in the center of Bristol. Broadmead & Cabot Circus are the two major precincts within the city's central shopping district. 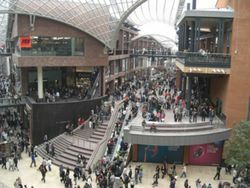 The newer of the two is Cabot Circus which opened in September 2008. The name was chosen by public vote after it was decided that the name 'Merchants Quarter' brought with it too many connotations to Bristol's slave trade past. It is a large, and mostly under-cover shopping centre, containing over 120 shops including House of Fraser, Harvey Nichols, 'Apple', Hollister, Boss, Ted Baker, Fred Perry as well as a Cinema Du Lux. Broadmead remains a pretty dire indictment of post war planning and architecture; it contains the Mall Galleries, Bristol's city centre mall. It is large and has a good range of shops. Most of the major department stores can be found in the streets outside. Department stores in Broadmead include Primark and Debenhams. Other high street stores include Lush, BHS, Next, New Look, River Island, Marks and Spencers, Waterstones, HMV, Currys, H&M, Miss Selfridge. The Mall Cribbs Causeway, , is an out of town mall off junction 17 of the M5. This has a large John Lewis and Marks and Spencer as well as lots of other fashionable shops. The surrounding area of Cribbs Causeway is also home to large stores such as TK Maxx and furniture stores, with The Venue – including the Vue cinema complex, and chain restaurants such as Frankie & Benny's, Chiquito's and TGI Friday's. Avonmeads Retail Park Situated between St Philips and Brislington, Avonmeads has a few out of town shops, restaurants, a Showcase Cinema and a Hollywood Bowl. Shops include Boots, Mothercare, Currys, Brantano, Outfit, The Range, JJB Sports and Comet, while restaurants include McDonald's, Chiquito's and TGI Friday's. A short distance away is Sainsburys. Park Street, Queens Road and The Triangle (marketed by the local traders as Bristol's West End) has a good range of fashionable clothes shops, book shops, restaurants, takeaways, record shops. Clifton Village contains a wide variety of smaller, more expensive boutique style shops, as well as some nice cafes and restaurants. Whiteladies Road has some small department stores, takeaways, restaurants, bars, an ABC Cinema, Clifton Down shopping centre, electrical stores, bookshops, gift shops. Old Market Street/West Street is just outside of the city centre where you'll find the charming areas of Old Market and Redcliffe and the rapidly developing area around Temple Meads Railway Station. Each offers its own feels but all are crammed full of beautiful architecture, interesting stories and friendly passionate locals. North St and East St, in Bedminster in the south of the city. A wide range of independent shops, also supermarkets, greengrocers, butchers, bars, cafes, delicatessens, charity shops. Gloucester Rd/Cheltenham Rd in the North, which contains a large number of cafes and restaurants, a number of instrument shops, many hardware stores and a good selection of independent butchers, bakers and greengrocers. At night, the restaurants and pubs attract lively nightlife. Fishponds Rd and Staple Hill in the East. Asian restaurants, thrift shops, bakers and independent stores. St Mark's Rd in Easton, in the east of the inner city, which is particularly noted for its mainly South Asian food shops and restaurants. It is also home to a modern vegetarian/vegan restaurant (Café Maitreya) that has won national acclaim. Corn St. Bristol Farmers Market on Wednesday mornings 0930-1430hrs. Local producers from a 40-mile radius sell a massive range of food from cheese, fish, honey, cakes, vegetables to meat, game and poultry at this award-winning market. All the produce is grown, reared, caught, brewed, pickled, baked or smoked by the stallholders. Tobacco Factory, Southville,, Sunday market 1030-1430hrs. It has around 30 stalls and leans strongly towards eco-friendly, fair trade and local products. Whiteladies Road market, Organised by local residents’ group Sustainable Redland, and held on the corner of Whiteladies Road and Apsley Road. Every Saturday 8.30am–2pm. Bristol has a huge choice of bars and restaurants to suit all tastes and budgets. There are many around the Harbourside and The West End's Park Street and Whiteladies Road, but do not be dissuaded from trying those outside the centre as many are superior to those that attract passing trade due to their location. After a night out, or if your hotel allows food delivery, you will also be able to find many takeaways in Bristol , with different variaties of food. There is a food aisle within the glass arcade at St Nicholas Market, near Corn Street. Many international cuisines are represented, including Italian, Indian, West Indian/Caribbean, Moroccan and Portuguese. One Stop Thali Cafe Southville, Totterdown, Clifton, Easton, Montpelier, tel: +44 (0)117 942 6687, . The Thali Cafe is an award-winning restaurant renowned for producing simple food full of exotic flavours, using local, seasonal produce and traditional Indian techniques. Las Iguanas, Whiteladies Road (opposite Clifton Down Shopping Center), Clifton, . Delicious South American food with the fresh flavors of lime, salsa and chillis. Wagamama, Queen's Road, . is a professionally run, good value Asian noodle bar. Main courses are filling, of consistent quality and cost £8-12. Walkable from the center, or take a bus from St. Augustines Parade/College Green up Park Street. Wetherspoons, Queens Road, Canons Road  Basic, cheap and cheerful food and booze. Severnshed, The Grove, tel: +44 (0)177 925 1212, . The famous eatery with a bar that moves (using compressed air). They serve modern cuisine, and prices can be reasonable (especially at lunch time / early evening when they do a number of meals for £9.77). Right in the heart of the city center, on the waterfront. Open every day noon-late. £8-£30. Walkable from the center. Boca Bar, Paintworks, Bath Road, Arnos Vale, . Gourmet pizzas from £9-12, tapas. Bell's Diner, 1-3 York Road, Montpelier, tel: +44 (0)117 924 0357, . A very well respected Bristol institution for those who know, Bell's serves up some of the most unique menus in the city, including their 'taster' menu where you get to work your way around everything. Open Tu-F noon-3PM (lunch); M-Sa 7PM-10:30PM. £18-£35. Hotel du Vin, The Sugar House, Narrow Lewins Mead, tel: +44 (0)117 925 5577, . This hotel has a wonderful Bistro with a great atmosphere. Food and service is of excellent quality. Starters about £7, main course £15 and dessert around £7. Walkable from the center. Cafe Maitreya, St. Marks Road, Easton, tel: +44 (0)117 951 0100, . Nationally acclaimed vegan/vegetarian restaurant. So good, even many omnivores enjoy it too! Open Tu-Sa 6:45PM-9:45PM. £16-20, excluding drinks. River Station, The Grove, tel: +44 (0)117 9144434, . The restaurant aims to be carbon neutral with naturally generated air-conditioning. Great location on the harbourside looking towards Redcliffe. Fresh locally sourced menu with a lean towards Mediterranean seafood. Casamia, High St, Westbury-on-Trym, tel:+44 (0)117 959 2884, . Located in the city's north-western suburbs, this Italian restaurant was awarded a Michelin star in 2009 and is currently the only restaurant in Bristol to hold that honour. The fact that it's the home to around 44,000 students probably says a lot for the quality of the city's nightlife. The eastern end of King Street in the old city provides a slightly more relaxed, but popular, outdoor drinking area on sunny summer evenings, surrounded by historic pubs such as the 17th-century Llandoger Trow (reputed to have been the haunt of pirates and the model for the Admiral Benbow in Robert Louis Stevenson's novel "Treasure Island"). The South West is famed for its cider and scrumpy and you will easily find pubs and bars in Bristol offering a host of different varieties. But if you are an ale or beer fanatic then you will not be disappointed either; Bristol’s craft beer scene is fermenting as well as the award-winning ale it produces. 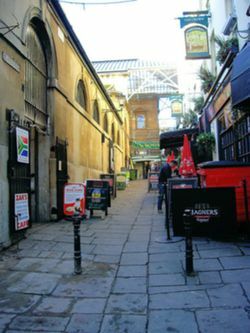 St Nicholas' Market, including Baldwin Street: on and around Corn Street, you'll find several chain bars, including Wetherspoons' the Commercial Rooms on Corn Street which was once a meeting place for Merchant Ventures. Other reliable venues include the Slug & Lettuce and Vodka Revolution on St Nicholas Street, All Bar One and Walkabout on Corn Street and O'Neill's and Reflex on Baldwin Street. Harbourside area: the regenerated waterside is a great place to drink, especially on summer afternoons. On Welsh Back, there's the famous Old Duke jazz pub and, opposite it, the famous Lladngoer Trow - plus, the Apple, a floating cider bar. Bristol's famous bar on a boat, the Thekla, is around the corner, and there are plenty of big chain and independent bars on Canon Road. Millennium Square has lots of chain restaurants and bars centered on the impressive mirrored 'Imaginarium' and fountains. The Waterfront by the hippodrome can be rowdy of a weekend and is best avoided. Park Street, Park Row, Clifton Triangle and Whiteladies Road: Whiteladies Road runs from the Downs on top of Blackboy Hill, past Clifton on one side and Cotham and Redland on the other; at the Triangle, traffic runs around the eponymous island of shops and bars before pushing down Park Street to the center of Bristol. There are hundreds of bars and clubs along this busy thoroughfare. Stokes Croft and Gloucester Road: the anarchic area of Stokes Croft is home to Bristol's big independent clubs, Blue Mountain, Lakota and Clockwork; after these monoliths, there are live music venues, pubs and bars to please the alternative crowd. Highlights include the Pipe and Slippers, the Crofters Rights, the Bell, the Flyer and the Prince of Wales. If you're a tourist in Bristol, you may enjoy visiting one of the city's pubs and bars with historic and literary connections. 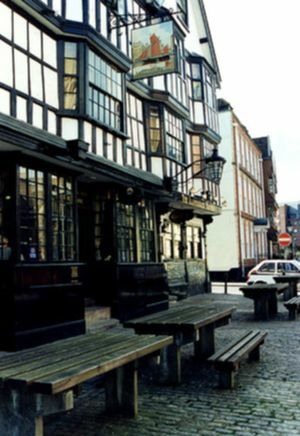 The Llandoger Trow on King Street is supposedly the meeting place of Daniel Defoe and 'Robinson Crusoe', Alexander Selkirk. It is also rumoured to be Robert Louis' Stevenson's inspiration for the Admiral Benbow pub in his work, Treasure Island. The pub is a 17th-century Grade II listed building. Abolitionist the Reverend Thomas Clarkson stayed in the Seven Stars in Redcliffe while he researched the British slave trade in 1787. Samuel Taylor Coleridge and Robert Southey used to meet in the Rummer Tavern to talk about emigrating. An earlier pub on the same premises, known as the Greene Lattis, was the first pub in Bristol to get a license, back in 1241. Actor Cary Grant often stayed in the Avon Gorge Hotel, which has a terrace bar opening out onto Clifton's best view of Brunel's suspension bridge. Pioneers of the Bristol sound, Massive Attack, established the Tube, a bar/club at the foot of Park Street. There are a number of traditional pubs located around the City Docks, such as The Cottage at the Hotwells end of the Floating Harbour, Grain Barge and the Nova Scota. These pubs can be accessed by foot or by harbour ferry. Bristol's an LGBT-friendly city, with a rounded and rich gay scene. There is something for all LGBT+ visitors in Bristol from the LGBT Festivals such as Bristol Pride, Trans Pride, Leather Pride and The Bear Fiesta to regular LGBT events, club nights, arts and film festivals, non-scene events which celebrate the unique queer culture of the city and intimate parties which host international performers and DJ’s from around the world. Queenshilling, Bristol’s oldest & friendliest Gar club and bar. Mixed, friendly atmosphere & home to popular nights including Hush & ESDR. Drop by for warm-up drinks, or party the night away in safe, fun, friendly surrounds. OMG, Bristol’s biggest LGBT+ club. Popular with the younger and student crowds. Expect dance, house & chart tunes. Busy at weekends. The Gin Palace, Infamous for its wonky floors, retro-chic decor & regular cabaret, The Gin Palace is one of Bristol’s oldest LGBT+ venues. If you’ve a fondness for drag, a penchant for camp or a sense of fun The Gin Palace is a must-see. Mixed & older crowds mingle with the younger LGBT+ scene. The Big Banana Juice Bar, . Great juice bar in the center of town at St Nicholas's Market on Corn Street. Fruit juices and organic wheatgrass. Into health and wellbeing. Juice promotions and promotional events. Blue Juice, 39 Cotham Hill, Cotham. Also serves wraps and salads. Shakeaway, The Arcade, Broadmead. Will make a milkshake out of pretty much anything, including Haribo, Mars Bars and Oreos. There are a large number of hotels and guest houses in the Bristol area. A selection is listed below. The Washington, St Paul's Road, tel: +44 117 973 3980, . A good value budget hotel in heart of Clifton with full English breakfast included in the price. From £26. Youth Hostel, 14 Narrow Quay, tel: +44 117 922 1659, . A modern, clean and very central YHA  youth hostel located in the Harbourside area; now with a newly revamped cafe on the quayside. Open every day all hours (reception 7AM-10PM). £17 (adult); £13 (under 18). Full Moon Eco Hostel, Stokes Croft near the '5102' apartments, opposite the large roundabout behind Debenham's department store and the bus station, . Dorm Bed £15 per person per night. Take note however that this hostel is situated right next to two of Bristol's biggest nightclubs with music going on until 5AM. Clifton Short Lets, Westbourne Place, tel: +44 117 923 7947, . Flexible short term accommodation in Clifton from one week to three month stays. Premier Inn, The Haymarket (near the Bus Station), tel: 0870 238 3307 (within UK only), . Standard rooms, nothing fancy, has everything you need as a reasonable price. Not ideal for long stays as could get a bit depressing. Room Prices: £50-£90. The Berkeley Square, 15 Berkeley Square, tel:+44 (0)117 925 4000, . If your visit takes you nearer to Clifton, this could be useful, just off Park Street (where all the best independent shops in the city are). The hotel is a lovely old 3* Georgian house; staying here also gains you access to the exclusive members-only bar in the basement. Rooms from £54. The Clifton Hotel, tel:+44 (0)117 973 6882. . Offers rooms full of individuality and character. On arrival new guests are welcomed with a gift of hand-baked biscuits and seasonal fruit. From £50. SACO Serviced Apartments, tel: +44 (0)117 970 6999. . An alternative to staying in a hotel. 150 well-equipped apartments throughout the city in seven convenient locations with friendly staff. From £65. Cadbury House Hotel, tel: +44 193 483 4343. Located just minutes from Bristol Airport and a short drive from Bristol city centre, this 4 star hotel is suitable both relaxation and corporate visits. Marriott Royal, College Green, tel: +44 (0)177 925 5100, . Four star hotel, the most famous in the city. From £75. Hilton Garden Inn Bristol City Centre, , Temple Way, tel: +44 (0)1779 251 001. This Hotel is perfectly situated in the city centre and just a few minutes walk from Temple Meads Station with regular trains to London, Cardiff, Birmingham and Bath. This modern contemporary hotel boasts 167 bedrooms, free Wi-Fi, Gym and City Café with a fantastic outdoor decking area to enjoy a glass of wine whilst watching the sunset. The Brigstow, Welsh Back, tel: +44 (0)117 929 1030, . A modern, contemporary hotel in the center of all the action, near Broadmead/Corn Street. Overlooks a very attractive stretch of the floating harbour. £89-£250. Hotel du Vin, The Sugar House, Narrow Lewins Mead, tel: +44 (0)117 925 5577, . Walkable from the center. Has spacious rooms and a restaurant and winery. Avon Gorge Hotel, tel: +44 (0)117 9738 955. Boast spectacular panoramic views of the Avon gorge and the Clifton suspension Bridge. Located in Clifton Village close to all the local restaurants, bars and the Clifton Downs. If you are feeling lazy or simply want to take in the views they also have their own bar and restaurant on sight which you can enjoy. From £115. The Grand Hotel (Formerly the Thistle), tel: +44 870 333 9130. Located in the center of Bristol, about a 2 minute walk from Corn Street and St. Nicholas's Market. It has its own health and leisure club. Ideal place to stay for either business trips or as a base for exploring the city. By using the same precautions as you would at home, Bristol can be a very safe city to navigate. Crime in the South West is lower than in the rest of the UK. Be careful around the water. Bristol is on a river, and as such there are many unfenced areas where shops, bars and restaurants run next to the water. If you have an emergency, call the police on 999. To report a crime which is not an emergency, call 101. NHS Direct  run a 24 hour helpline if you need emergency medical help but it's not life-threatening. The NHS 111 service is staffed by a team of fully trained advisers, supported by experienced nurses and paramedics. They will ask you questions to assess your symptoms, then give you the healthcare advice you need or direct you to the local service that can help you best. Bristol Royal Infirmary  has an Emergency Department. Southmead Hospital  has an Emergency Department. Minor Injury Unit available, only open limited hours. Frenchay Hospital  has an Emergency Department. Bristol's landline area code is 117. Dial 0117 from within the UK or +44117 from outside the UK. Free wi-fi is easy to come across in the city in many of the cafes, restaurants and bars. The Tourist Information Centre on the harbourside offers free unlimited wi-fi. Bath, with its famous Regency terraces, Roman remains and spa facilities, is only some 12 miles drive or 15 minutes train journey away, and makes an excellent day trip from Bristol. Wells, with its beautiful cathedral, is a hour's coach ride from Bristol. Weston-super-Mare, probably the nearest sea-side resort with a sandy beach and plenty of entertainment suitable for young families. An adult day return from Bristol Temple Meads is £5.50. If possible, take the train to Weston-super-mare as an adult day return from the bus station will cost upwards of £8. Online details of public transport options can be found at Transport Direct . The Cotswolds and the Mendips, two popular rural tourist destinations are both an hour from Bristol. Exmoor National Park, Dorset, Devon, the Forest of Dean and the Brecon Beacons are within reach for day trips. Abseiling and rock climbing activities  are available in Avon Gorge with Sheer Adventure.